Looking for a few great company to buy and hold for the ultra long term? Our team of Fools thinks these three stocks are worth a closer look. At the Motley Fool we are convinced that the best way to grow wealthy is to buy shares of wonderful businesses and hold them through thick and thin. While that's an easy enough concept to understand, finding those "wonderful" business isn't exactly easy. Matt DiLallo: Brookfield Asset Management has an excellent track record of delivering market-beating returns, generating an 18% compound annual return over the past two decades. The Canadian alternative asset manager sees more of the same in the years ahead with the company's base case forecasting 22% total annual returns over the next five years. Driving that growth is the continued expansion of its asset management platform as well as the growth of its renewable power, property, infrastructure, and private equity businesses. In a world where cash and most liquid assets that are easily convertible to cash earn a zero return, the utility of cash would seem to be zero. But we would argue that cash is becoming increasingly valuable, given that we are nearly eight years into a bull market, and the fixed income markets are near highs. He then went on to explain how the company used cash in prior downturns to invest in some of its best assets. That's why Brookfield continues to ensure it has ample financial resources for the future, with Flatt concluding his message on cash by saying, "Bottom line: cash only matters when it matters. And when it matters, it really, really matters." Not only are lessons like that invaluable to investors, but they flow out of the company's values and investment philosophy. That's why I trust Brookfield with my money and have no intention of ever selling any of my stock. Brian Feroldi: Latin American trade bank Bladex is far from a household name, but this is certainly a company I can't ever see myself selling. Bladex was created by central banks in Latin America years ago to help finance trade in the region. As a trade bank, the company doesn't have normal retail customers. Instead, Bladex helps facilitate trade between the region's exporters and importers by providing financing, letters of credit, and other banking solutions. You're likely aware that Latin America has been going through tough times recently. There has been a lot of political turmoil in countries like Brazil, which is the region's largest economy, and the collapse in energy prices has hit countries like Chile, Peru, Venezuela, and Colombia quite hard. 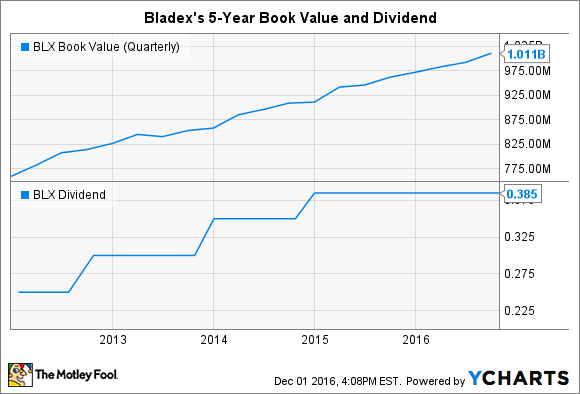 BLX Book Value (Quarterly) data by YCharts. This excellent track record speaks volumes about the bank's resiliency. I can only imagine what kind of results the company will be able to put up once the region's economic activity turns around. That's why I plan on hanging on to my shares for years to come. Tim Green: If there's any stock to buy and hold indefinitely, its Warren Buffett's Berkshire Hathaway. The conglomerate has grown into one of the largest companies in the world, with a market value of nearly $400 billion, thanks to decades of good decisions and the magic of compounding. The impressive rate of growth achieved in the past may not be repeatable going forward, but the table is set for solid performance far into the future. Berkshire produced $24 billion of net income last year. Some of its businesses, namely insurance, can be volatile and unpredictable. But the company has moved deeper into non-insurance businesses in recent years. The $37 billion acquisition of Precision Castparts earlier this year is the most notable example, giving Berkshire a wildly profitable manufacturer of industrial parts and equipment with significant competitive advantages. Finding deals big enough to move the needle for Berkshire has become the company's biggest challenge, but Buffett has shown no hesitation in pulling the trigger when a deal makes sense. In some ways, shares of Berkshire Hathaway act like an index fund. Investors get an array of wholly owned businesses as well as the company's vast portfolio of investments. The difference is that Buffett has attempted to construct a collection of businesses and investments that are superior to the average. Given Berkshire's track record, I have no problem betting that this approach will continue to work well into the future.